Pure waterjet cutting started becoming widespread approximately 35 years ago in the USA. Following on from this, the technology became more versatile with the addition of abrasives to the waterjet. This enabled the waterjet to cut through harder materials such as metal, stone and hard plastics. With today’s technology an even wider range of materials can be cut including glass and high strength composites. Abrasive waterjet cutting (AWJ) requires a high pressure pump that can produce a water pressure of 4100 bar or above. The pressurized water is delivered to the cutting head where it passes through a small orifice in piece of industrial sapphire or diamond (Picture 1). This nozzle controls the waterjet to a diameter of 0.2-0.3 mm. This extremely high energy waterjet then passes into the mixing chamber past an orifice where the abrasive is introduced (Picture 2). The abrasive and the waterjet finally pass through the mixing tube further mixing and focussing the waterjet ready for cutting. There are several parameters that must be controlled to achieve a good result. Generally, the cutting feed rate is adapted to the desired finish of the cutting surface and thickness of the material. 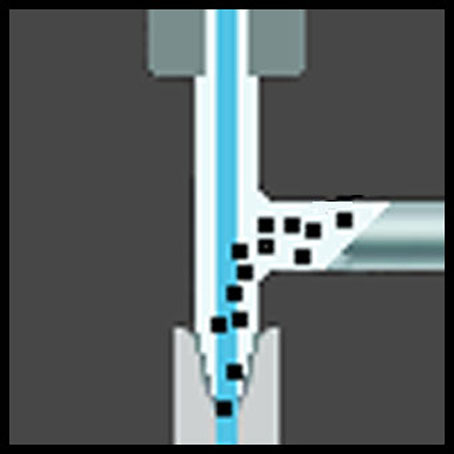 Feed rates can be increased with water jet pressure; current maximum pressures are up to 6000bar. It is also possible to use the waterjet to mark out material for future processing e.g. drilling, machining, or folding. Abrasive waterjet cutting can achieve fine tolerances and intricate cuts however, the cutting surface becomes very slightly angled (Picture 3). The angle on the cut surface can be eliminated using Kimtech’s optional 5-Axis head and taper angle compensation software if required. 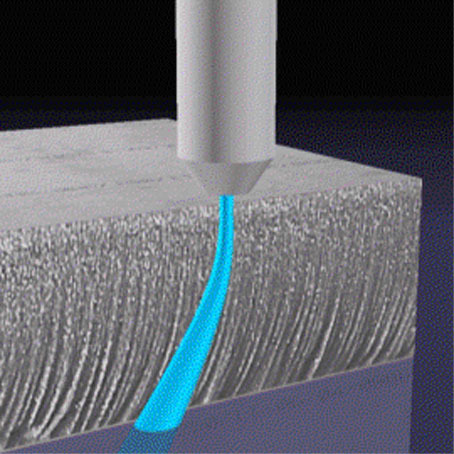 It is a cold cutting method; there are no residual stresses or composition changes in the cut material. It is flexible: well suited for small series, one-offs or larger batches. You can cut thin as well as thick materials, up to 300 mm steel. It is possible to cut difficult contours. There are very small cutting forces. Over the last ten years AWJ has been the most developing cutting method.